Love is in the air, and it has a Cajun flavor. Follow the lives and loves of a southern wedding planner and some of her fun-loving—but meddlesome—cousins in this contemporary romance series. Set in the fictional, quintessential southern city of Bonneterre, Louisiana, the Brides of Bonneterre series is filled with fun, food, family—and lots of romance! Although each volume deals with serious themes such as forgiveness and fear, the tone is lighthearted and humorous, with plenty of southern charm, wit, and wisdom mixed in. All three books in one volume! I saw the cover of Stand-in Groom on your Facebook profile today. It caught my attention, so I dashed over here to read about. Gotta have it. I’m heading to Amazon now to pre-order. Thanks, Keli! I hope you enjoy it! My daughter and I love Stand in Groom! It was refreshing, fun, and so nice to read a book about love, but also forgiveness and letting go. Great book! Now that I’ve read Stand-In Groom, I can’t wait for the others. Forbes was such a neat character in it that I had actually hoped while reading it you’d write one for him. Guess I have to wait until 2010 for that one, though. LOL, Eileen! I pulled away from typing in a scene of Forbes’s that I hand-wrote last night when I got the notification of your comment. I am almost finished with Stand-In Groom. I am thoroughly enjoying it. I’m glad to find out that there are more in the series. I can’t wait to read them. I really enjoyed Stand-In-Groom. Honestly I had never heard of you before. I love Karen Kingsburry and your book struck me as her same style.The cover a book also entrigues (sp?) me. So with both of those going for you I bought it and I LOVED it. I seroiusly read the last 20 chapters in one evening! Could NOT put it down before going to bed. I had to know how it ended! Came here from Facebook, saw that you’ve got the third book in the works. i’m sooo excited. i can barely wait for the third book, let alone the 2nd one! yay. keep up the good work. and i love your new haircut! I finished Stand-In Groom 2 days ago, and absolutely loved it. The typical book of my choice has never been one with a religious “theme” to it. The story behind my choosing Stand-In Groom is, I went to WalMart in search for a new book to read. While browsing the reading material, the title caught my attention but I didn’t pick it up to check it out. Well, I continued to look at everything else on the shelves, but I kept the book in the back of my mind. So, after about 45 min. of looking at everything and still not being able to pick on that had my full attention, I went back to read the back summary. When I noticed that it had a religious “theme” I was a little stand offish and returned it to the shelves. I ended up walking away to finish up my shopping. Once I was finished and about to get into line to check out, I couldn’t resist the urge that I felt to go back to the book section and get it. Well, of course I bought it and more than happy that I did. It is one of the best books I have read in a very long time. Thank you so much! Wow, Amy–thanks for sharing! I’m definitely sharing this info with the marketing department at Barbour. You know, we changed the name of the book after they acquired it. Originally the title of the book was the same as Anne’s business: Happy Endings Inc. I’ve heard so many stories like yours about how the title Stand-In Groom caught the reader’s attention that I’m so relieved the marketing department decided the original title didn’t work. The way we came up with the new title is that my agent, my editor, and I all came up with a suggested title, and I ran a contest here on the blog for my blog readers to choose the title—and my title won! I have been reading your blog for a while, and just bought Stand In Groom, and LOVED it. And then I just HAD to find out whether Menu For Romance was about Jenn or Meredith! I can’t wait to get to know the characters even more. I loved everything about the book, and can’t wait for the rest!! I’m so glad you enjoyed Stand-In Groom. I hope you’ll enjoy Menu for Romance as much as I enjoyed writing it! Just found you. Am adding you to my TBR list!!! Do you have a newsletter to keep me abreast of your work? Hi, Linda–glad you found the website. I happened to pick up this book for my mom and ended up reading it without putting it down. I loved this book because it’s not so unrealistic like so many books out there. You did a wonderful job on this book. It was exciting from the first word to the last. I am looking forward to the next books in the series! I can’t wait. Thanks, Stefania. I’m so glad you enjoyed it—and I hope your mom does, too! Can’t wait to receive Stand In Groom from Amazon — it looks like it will be a fun read! Love the cover — as a New Orleans girl I spotted my favorite plantation, Oak Alley on River Road! Wishing you much success in your writing and publishing! Thank you, Joanne! I was so pleased they chose Oak Alley as the backdrop for the cover. There’s nothing that clues a Louisianian in on the fact something’s set in LA than seeing that house on the front! Just read Stand-In Groom and absolutely LOVED it. Funny, Witty, Charming & Romantic, & Inspirational..you can not beat that! I can not wait to buy and read the others !!! Hope there will be a book coming out about Jenn though. 🙂 I also thought the covers and title are GREAT!!! Thanks for writing this series and May God continue to bless your writing. Thank you so much, Maranda. Unfortunately at this time, there is no fourth book planned for the series. But I hope to eventually write Jenn’s story. I have so many potential matches for her, it’s scary! And then there’s Rafe and Jason and Jonathan and Kevin . . . oh, and Alaine’s younger brother from Menu and Case . . . so many stories waiting to be told! I totally agree! Please write a 4th Brides of Bonneterre book that features Jenn. (You have a built-in audience ready & waiting!) I’m not sure who Jenn will finally end up with? When I read “Stand-In Groom,” which I loved, I felt sure that George’s younger brother, Henry, would be her true love. But then, having just finished reading “Menu for Romance” this morning, which I also loved, I’m thinking perhaps not. Wonder if it’s someone we’ll meet in “A Case for Love”? BTW, can’t wait to receive that book & continue spending time w/ this wonderful, huge family! Now that I’ve followed Forbes for two books & met Alaine in MFR, I’m primed to see Mr. always-in-control lawyer be humbled by love. 😉 And the Christian message that runs subtle, but strong throughout your books is a breath of fresh air for the soul! Thanks, Jeannie! And thanks for doing a giveaway! I just finished Menu for Romance and can not wait to read A Case for Love. When I started reading Stand in Groom I could not put it down. I finished the book in 2 days and was so excited that Menu for Romance was available. Again, I was unable to put the book down. Looking forward to the third book I will definately pre-order the book so I get it as soon as I can. Thank you so much for the great series and I hope to see more! Jacquie, I’m so pleased you enjoyed reading the books. I love finding books to read that capture my attention like that, and I’m glad mine did that for you! I just finished reading Menu for Romance and loved it! Thanks for posting the review, Erin. I’m so glad you enjoyed reading the book. Kaye, I read Stand in Groom when it camr our in two daays and couldn’t wait to get my hands on the next one. It didn’t dissapoint either. I was moving at the time and Menu for Romance was what i took to bed to relax after packing. I read it very quickly as well. I can’t wait to read about Forbes in A Case for Love. I just hope that there will be a book for Jenn as well. She has me captivated. A woman chef that owns her own resturant, but is not yet attached. Good stuff. I loved Stand in Groom and Menu for Romance!! Thanks for letting me be an Influencer for Menu. I enjoyed it and cannot wait for the next one. Everywhere I have checked (Lifeway, Walmart, Books-A-Million) they have had Menu with the cover facing out. I am passing the word about your wonderful books. I am about to start reading Ransome’s Honor. Have a blessed day! Thanks, Patricia! I hope you like RH, too. Oh my goodness! Stand in Groom is one of my favorite books 🙂 I loved it and I look forward to reading the others!!!! I’m so glad you liked it, Kelli . . . and I hope the others are just as much fun for you as the first. I just read Menu for Romance and Stand-In Groom. Loved them. I was thinking there has to be another book following these two because I need to know what happens with Forbes and Jenn. I was so excited to see Forbes and Alaine are in the next book. I read these two since Friday and boy am I tired :). I can’t wait until Spring to read the next book. Your writing is truly a gift from God. Thank you so much, Angela. It’s a gift I enjoy “re-gifting” to everyone who reads my books. I have an obsession with weddings and event planning, I love the behind the scenes life (hence the reason I freelance in this arena.) That is how Stand in Groom caught my attention and recently while in the bookstore I saw Menu for Romance and grabbed it. One comment I must make, outside of the event planning business you have touched two things I love, the music of The Rat Pack and John Wayne. Like the characters in the book I have made many arguements for The Rat Pack’s music and The Duke’s movies. Cannot wait to see what other little thing you bring to us in the third book. I have loved getting to know the Guidry family. The “other little thing” in A Case for Love is a little different, but I still had a lot of fun with it. I saw Stand-In Groom at the library where I work and I just grabbed it randomly ( I do that from time to time). After getting halfway through the book I was unable to put it down. I finished it just in time to return it, but a week after, I got it again to read about George *giggle*. I am hoping that a sequel comes out for Stand-In Groom where we find out what happens after for Anne and George. If there is a movie made from this book, I got dibs on playing Anne. LOL. Now onto the next book! Rebekah–your wish has come true! Menu for Romance is the sequel to Stand-In Groom and it came out in July—and it shows what happens with Anne and George after their Happy Ending. You should be able to find it at most major booksellers or at Walmart or from any of the online booksellers. Just finished reading Stand-In Groom and Menu for Romance and loved them! Can’t wait to read about Forbes in this next book. He was one of my favorite characters from the 1st two books. I also loved Jenn! I’m really hoping you will write her story or at least have included it in the 3rd book. I know it says that ” A Case of Love” is due out in Feburary, but when exactly. Maybe I can treat myself to the book for my birthday if it comes out around that time. As far as I know, it should be out around the beginning of the month. Most of my books have actually started making it out to stores a couple of weeks in advance of that release date. I can’t promise anything, but they were in sort of a rush to get my edits back a couple of weeks ago, which makes me think they’re pushing for getting it out early. Thanks so much for sharing your gift with us. Hopefully you won’t have to wait much longer now. A Case for Love should be out in a couple of weeks! I have read both “Stand-in Groom” and “Menu for Love”. I have laughed and cried right along with the characters of each book. I am dying to get “A Case for Love” and start reading!! I can hardly wait!!! I can’t believe that this will be the conclusion to the series. These romances have been so true to life. Everyone, at one time or another, has faced these same fears. It is so comforting when you read of these couples who look to God to find the answers. God does answer prayers…..but in His time. That is one thing I learned the hard way. I have loved and lost three times. My first two were unfaithful and the last was abusive. Although I did things my way, instead of looking to God for answers and having patience enough to wait for the special love that God had planned for me the Lord has still blessed my life tremendeously. I have two beautiful children. I couldn’t have asked the Lord for anything more perfect than the love these two angels have given me. I have lost my chance at true love, but through your books I can experience the feeling and emotion over and over again. There’s also their cousin (Anne’s younger foster brother) Jason. So, yes, I have thought about another Bonneterre series . . . but it’ll have to wait until after the Matchmakers series, which I hope you’ll enjoy, too! Another cousin! Jason! YES!!!! Thank you!!! Well, I’ve read all three books (I get to read the on NetGalley) and love them! And I really, really think you should definitely continue with the family. I would love to see who Jenn meets up with. Now, I just need to read your other books. A Case for Love is up for a giveaway at the following address. I love the brides of Bonneterre series. I bought A Case for Love yesterday afternoon and finished it before I went to bed. I can’t wait to see who Jenn hooks up with, maybe Shon. Thanks for the clean reads. I can’t wait to read more. Kaye, I just finished “A Case for Love.” It was such a wonderful read!! Had me laughing out loud…that doesn’t happen much for me when reading a book. I’d love to see you continue the “Brides of Bonneterre” series. I can’t wait to read more from you. I really loved A Case for Love. Forbes was my favorite. We need more Forbes in the world!! I am anxiously awaiting your next release. I love, love, love the book A Case for Love!! As I have read each book in this series, I really feel as if I know these people. I hope that there will be another in the series. I have been looking for the sequal to Menu for Romance for a while. For some reason I was under the impressison Jenn was going to be the subject of the next book, not Forbes (not that I’m disappointed). I think I read a synopsis of it somewhere. Will we ever get to read Jenn’s story? Thank you so much for writing the best southern books I ever read!!! I’m from Louisiana and I love reading the words y’all and fixing when I’m reading!!! I know that’s weird but what can I say. I’m nerd! Please tell me you are writing some more books from this series!!! I need to know more from this family!! I can’t tell how many times I go back and reread them!!! Thank you!! You’re such a wonderful writer! I love the new matchmakers series! But please don’t forget the Guidry family!! Can’t wait to read A Case for Love! 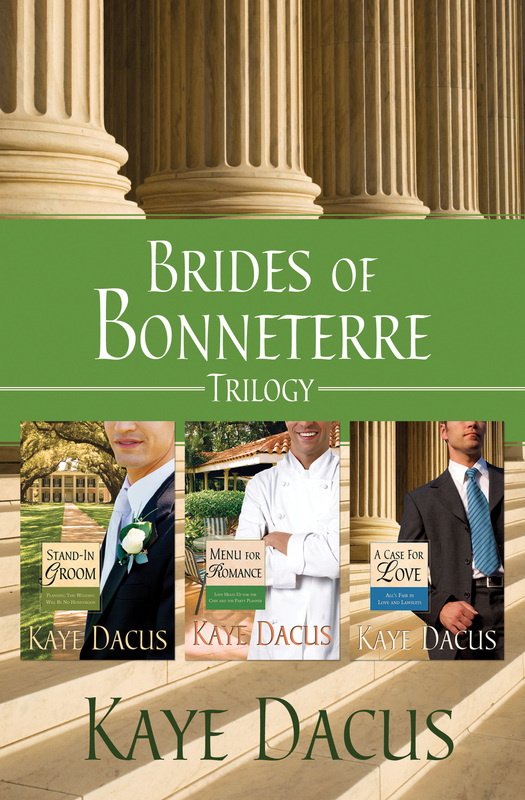 I so loved the Brides of Bonneteree Series. I have read all three of them. Are you going to write more in this series? I would love to be able to write at least one more book in this series. I have an idea for another trilogy, but found out that my publisher has changed direction and a stand-alone series doesn’t fit their new fiction lines. 😦 However, there’s always the possibility of putting something out on e-book in another couple of years, once I finish my new historical series. I would definitely love to tell Jenn’s story, if nothing else! I want to hear more about George and Anne! But we don’t want to leave Jenn out. Will she ever find love? I might do a novella featuring Jenn sometime in the next few years.